A U-Haul truck rammed into the front entrance of a county Health and Human Services building in Kearny Mesa Monday morning in what police believe could be an intentional act. Photo via OnScene.TV. 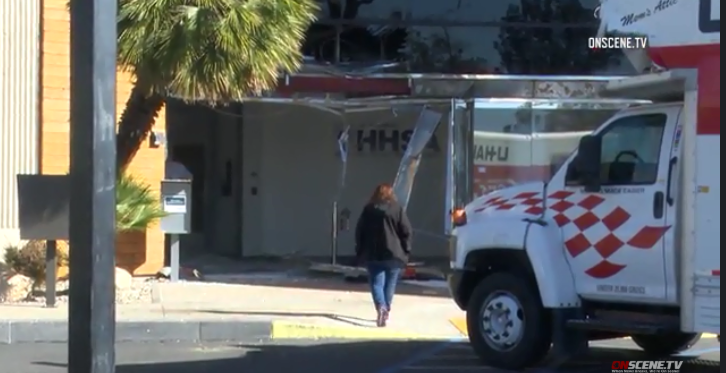 A U-Haul truck rammed into the front entrance of a county Health and Human Services building in Kearny Mesa Monday morning in what San Diego Police believe could be an intentional act. The office of the Housing and Community Development Services at 3989 Ruffin Road was shut down after the rental truck crashed into the building at about 6 a.m., according to the county’s Twitter account. No injuries were reported. The driver fled on foot, according to the county. NBC7 reported that expletives were spray-painted on one side of the truck, and that police are investigating the incident as a possible intentional act.